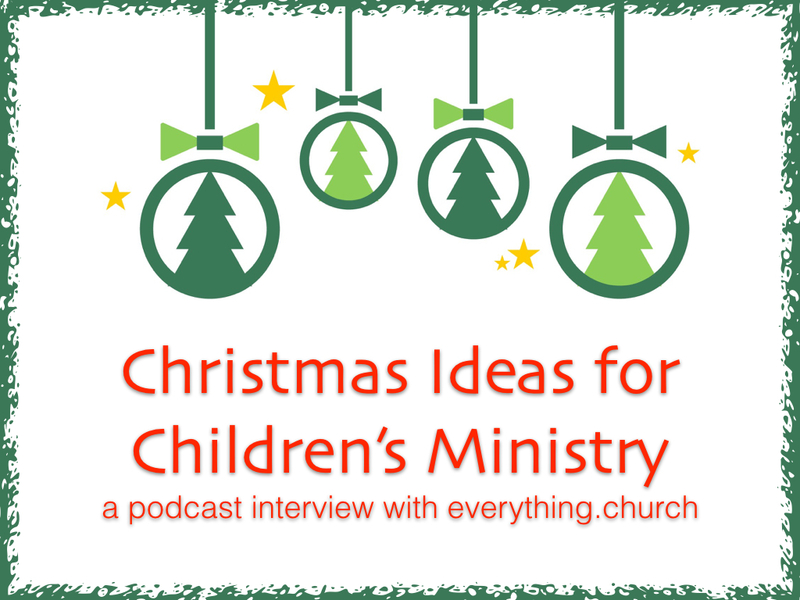 Are you looking for some fresh ideas for Christmas for your children's ministry? In a recent interview with everything.church, I shared some ways your children's ministry can make a big impact during the Christmas season. You can listen to the interview on itunes here. Below is also a written summary of the conversation. Head over to everything.church's website as well, they are giving away a copy of my book Turbo-Charged Children's Ministry. 1. Since more people attend church at Christmas than any other time, what are some of the ways Children’s Ministries can leverage this? Dale shares some invite strategies they use for families. Christ Fellowship creates photo ops for families. They know that people will stand in line for hours to get a picture at the mall with Santa, so they capitalize on that kind of idea. They typically have a character for the photo ops (Frozen characters, elves, etc.) and they, of course, use photo props like so many other churches, but they brand their props with their children’s ministry logo. So, that when people share them on social media, people have the opportunity to learn about their kid’s ministry. Dale shares how Christ Fellowship’s Kid’s Ministry does a “Happy Birthday Jesus Party” where everyone gets a piece of cake and gets to be part of a huge birthday for Jesus turning the focus to Him the week before Christmas. Birthday parties are very special to kids, so we think this is a great idea to get kids excited about church! Additionally, Christ Fellowship does a Christmas Family Experience almost like a Christmas play that is held on a Friday night, and tons of people show up to that including relatives and friends of church members, who might not normally come. They then use that event to point people to the weekend. Dale plainly talks about how families are looking to have experiences together during the holidays and if you provide them with opportunities people will show up. Christ Fellowship gets snow machines for every campus. He explains simple, little, steps like that can have a huge impact. 2. Often times churches don’t actually have a Kids Service during the Christmas Services, is there still a way to engage and motivate kids to want to come back? Dale shares how they offer nursery and preschool during their Christmas Eve services, but craft their Christmas services in such a way to engage elementary students. They have tried to do something separate for all kids on Christmas Eve at Christ Fellowship, but in Dale’s opinion families want to be together during this time, and kids, even preschool kids often seem to be with their parents in the service, no matter what they do. Dale shares an AMAZING tip that they do at Christ Fellowship at their Christmas Eve Services. They provide a little bag for kids that contains Christmas coloring sheets, crayons, and information about their kid’s ministry. This a great idea even for a first-time guest, because even though there’s no kids’ ministry being offered, they still have a way to learn more about it. 3. One of the things we love to say at everything.church is that the world is looking for the best of the world’s culture and church’s culture to collide. A perfect example of this would be having Santa Clause at a church event. How do you respond to critics and naysayers in moments like that? Dale shares that when you make a decision about how far into the culture you are going to dip, there are always three types of people that emerge. Dale shares they are always creating with the “typical family” in mind. They don’t allow the extremes to influence their decisions. He said while you will get push back for conservatives, it doesn’t matter to them, because they are always trying to make decisions that the average family can relate to. Dale shares that they have a typical response to people who would criticize and it simply says this. We know that there are lots of different people at various levels of conviction and preference and this is the direction that the church has chosen to go to make a connection with people and we ask you to please honor the decision of the church even if you disagree. Stacia shares how one small element of wonder or culture that kids understand can change the outlook of a child’s whole experience with church. A hook is imperative when kids are the next generation of people who will have faith in our nation and world. Stacia talks about continuously keeping the “goal in mind.” Who are you creating your events for? These are the questions that always need to be at the forefront of your decisions, because if you got the result that you were wanting to achieve, it will be easier to defend why you made certain choices. 4. If you build momentum near Christmas, how can you keep it going into the New Year? Dale shares the first thing you have to do is give people a great experience at their first visit. Dale quotes Andy Stanley who says, “create irresistible environments that will draw people back. Dale shares that even if your follow-up is out of this world, it won’t matter unless people had a great experience. Dale clarifies that follow-up is necessary. He shares how they send a hand-written postcard to every child who visits for the first time with a coupon for a free t-shirt on their next visit. At Christmas, they give away coupons for a free t-shirt or gift to every kid that attends the Christmas Eve service as well. Dale shares that they try to send out their postcards within three days of their visit. The guest services team fills out the postcard so that it is done before the services are even done, which is a fantastic tip and a double win!! 5. Lastly, what is the most memorable Christmas moment that you’ve ever had with kids and what made it so powerful, even magical? Dale loves when a kid finally gets that Christmas is about generosity and giving and blessing other people. He shares several stories on the podcast that you’ll have to listen, to hear how awesome they are!